Is it really Wednesday because it really feels like Monday. Moses and I took Monday and Tuesday off and treated ourselves to a ridiculously long and wonderful weekend. We puzzled (as in we put together a puzzle), went out on dates, watched movies, and worked a teeny tiny bit. Yesterday, we celebrated the Fourth with a bunch of babies. Literally. And lots of babies' parents. It was glorious and exhausting, mostly glorious though. My new besties Wyatt and Emmett and I did a lot of leg bouncing, we made a bunch of silly sounds and faces, and ultimately powered through the afternoon without napping. 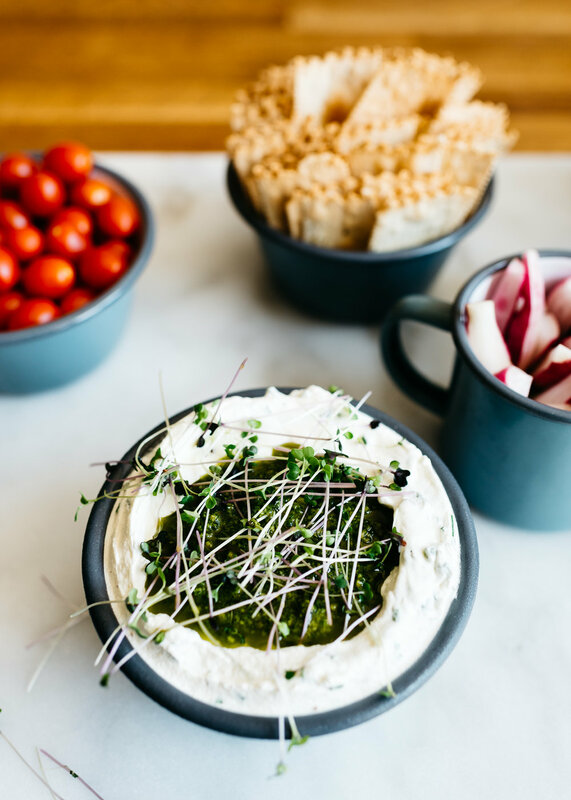 We also stuffed our faces with my friend Shelly's insanely airy whipped goat cheese and pistachio pesto dip. Which, tbh, I was super surprised by. Not by the fact that I was stuffing my face with dip, nothing new there, but by all the little babes loving on the dip. I thought I was bringing a snack for all the adults, but those babies showed me. I've never seen so many veggies being double, triple, and quadruple dipped in my life. This is the second time now in a week that I've made Shelly's dip. It's the perfect party dish and the pesto is to die for--I wanna put it on all the things. And it's just one of the many great recipes from her new book, Vegetarian Heartland. It's packed with crave-worthy vegetarian recipes, organized by both season and adventure (camping!, picnics! ), and really make me feel like I need to start getting to know the midwest. As I said, I thought I was making it for the adults and making the crazy s'mores rice crispy bars (pictured below) for the kiddos, but this is a dip for all ages. I'd say there's a really good chance it's gonna make it to another summer party this year! Ps - If you've been following along with my Insta Stories, you know how pumped I am about growing my own microgreens (that's them up above in all their glory)! I used some of them to top this dip and felt so good knowing I grew them myself! Shout out out to the folks at Hamama for making it so easy! REPRINTED WITH PERMISSION FROM Vegetarian Heartland. COPYRIGHT © 2017 BY Shelly Westerhausen. Place a bowl of a stand mixer, and a rimmed plate or shallow bowl in the freezer for 10 minutes to chill. Meanwhile, in a food processor, combine the pistachios, arugula, chives, basil, mint, and lemon juice and process until combined, about 30 seconds. With the motor running, slowly pour in the olive oil and process until the pesto is smooth. Season with salt and pepper. Remove the chilled bowl from the freezer and attach to the stand mixer. Combine the goat cheese and heavy cream in the chilled bowl and beat at medium speed just until stiff peaks form, 5 to 6 minutes. Spread the goat cheese mixture evenly over the bottom of a rimmed plate. Spoon the pesto over the goat cheese mixture, spreading it evenly. Drizzle with olive oil and sprinkle with microgreens (if using). Serve immediately with pita chips, crackers, or vegetables. Note: I added some fresh chopped chives to the goat cheese mixture because I had extra.